Available as low as $3.71 per oz over spot! During the first two decades of the 20th century, the United States Mint embarked on a mission to revamp and redesign all of its circulation currency. 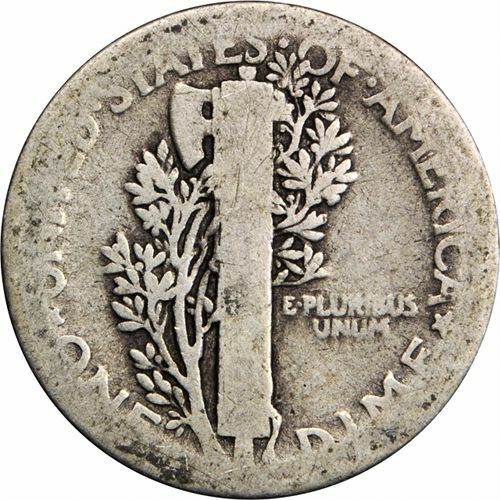 The drive started in 1905 under the guidance of President Theodore Roosevelt, and reached its zenith in the 1910s with the release of new designs for the half-dollar, quarter, and dime. 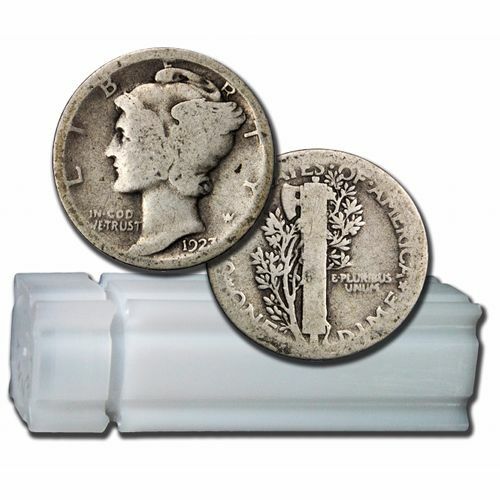 Today, the 90% Silver Mercury Dime is available to you online at Silver.com in a $5 roll. Ships to you in a plastic tube containing 50 dimes! 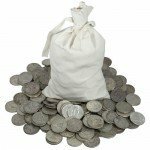 Consists of 90% fine silver content per coin. Individual face values of $.10 (USD) fully backed by the US government. The original Mercury Dime was in circulation from 1916 to 1945. It was replaced as the design of the dime quickly following the death in office of President Franklin D. Roosevelt. 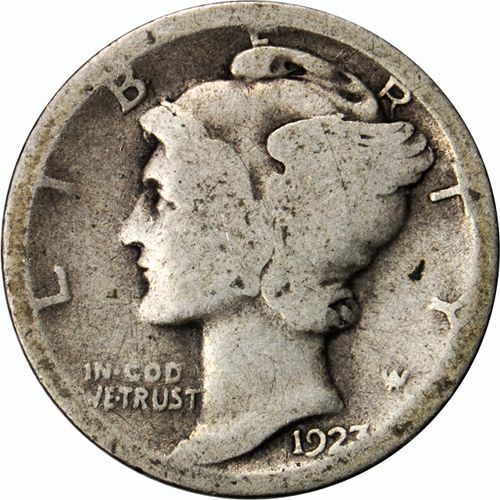 The dime was chosen by the federal government, Secretary of the Treasury, and US Mint because of President Roosevelt’s prominent March of Dimes program. Weinman’s original design featured a left-profile portrait of Liberty wearing the Phrygian cap on the obverse side of the coin. The word “Liberty” was engraved above her head, with “In God We Trust” and the year of issue featured below. 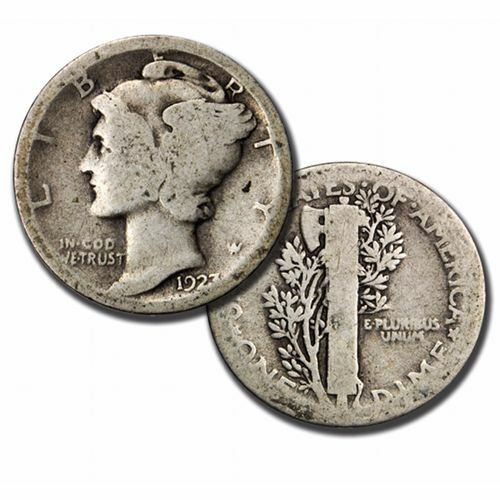 Your purchase of this product today includes a total of 50 US Mercury Dimes from the circulation period of 1916 to 1945. The coins arrive in a plastic tube with a total face value of $5 (USD) backed by the US government. 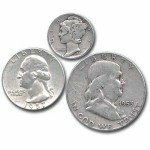 Mercury Dime coins were originally produced at the Denver Mint, San Francisco Mint, or Philadelphia Mint. Only the Denver and West Point Mint coins had mint marks, and each individual dime contains .07234 Troy oz of silver content. In 2016, the US Mint revived the Mercury Dime in the Gold Centennial Series, a collection of 24-karat gold coins marking the 100th anniversary of the Mercury Dime, Walking Liberty Half Dollar, and Standing Liberty quarter. Please direct your questions to a Silver.com associate at 888-989-7223, connect with us online using our live chat, or email us directly. You can shop for more junk silver on our website!